Beyond the beautiful Budapest, there are more places to visit in Hungary, such as the Danube Bend. On this tour we start from Budapest and our first stop will be Szentendre. This charming town is known for its museums galleries, and artists. Here you can have a taste of a traditional Hungarian village. Halfway between Szentendre and Esztergom, we will stop by Visegrád. 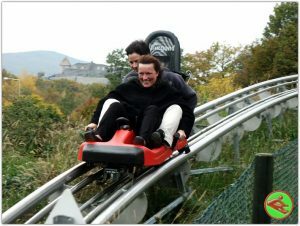 If you like adventures, or you would like to treat your children try the famous Bobsled in Visegrád’s breathtaking view. Be sure to come with an appetite. There is a restaurant on top of the hill called Nagyvillám. They are famous of their beautiful view from the restaurant and their Mediterranean food. To book the transfer, please contact us in our office , where you can fill in all the information we need to know, such as the number of passengers, date of your trip, the pick up and drop off address, preferred time.